One of my 2016 goals was to be more timely with my posts — obviously, I’m already slipping — but in the meantime I’ve got some catching up to do. 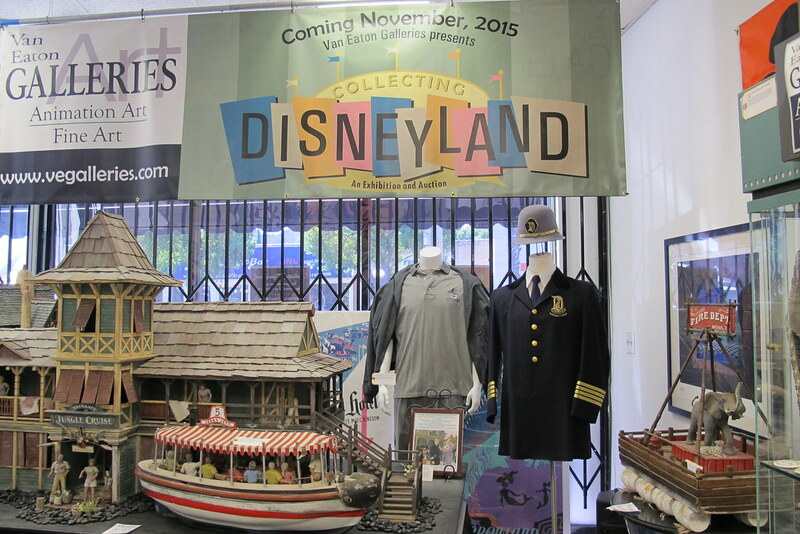 Last February, the Van Eaton Galleries in Sherman Oaks presented “The Story of Disneyland,” a massive auction of Disneyland memorabilia (as covered in a previous blog), and it was so successful that they did it again in November. 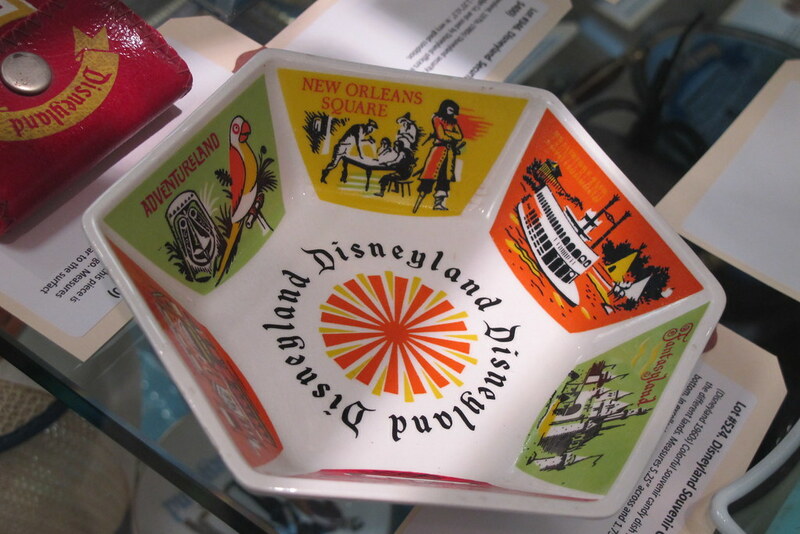 The first auction was the stockpile of one person, while “Collecting Disneyland” featured items from more than 20 different collectors. 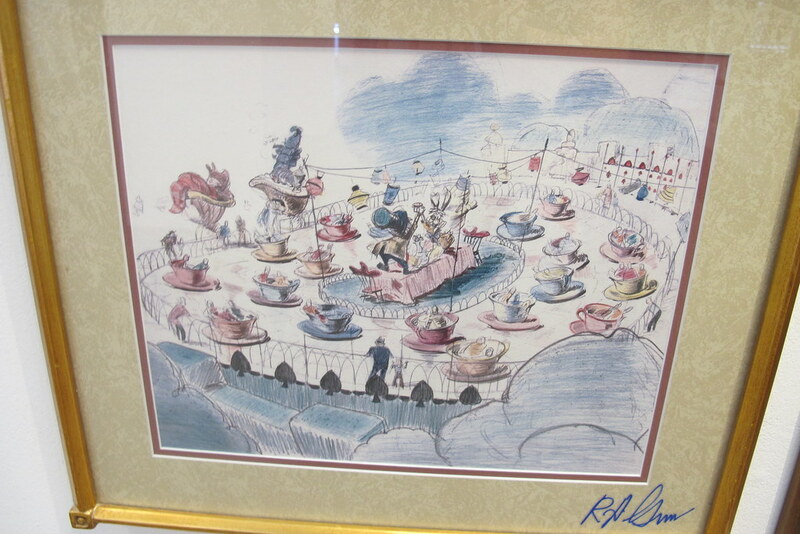 They ranged from souvenirs and ephemera like popcorn boxes to concept art, cast member costumes, Imagineer prototypes and models, attraction posters and even ride vehicles. 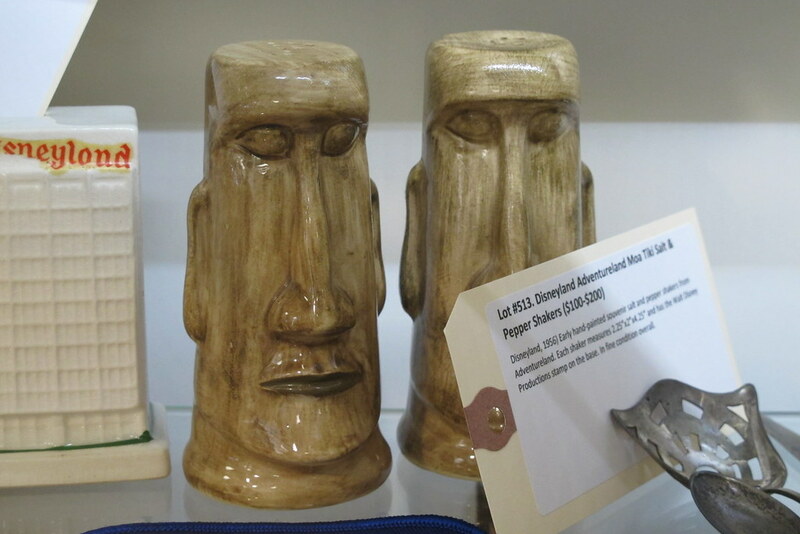 Some of the lots were repeats of things we’d seen in the last auction, like these Adventureland Moai salt and pepper shakers. 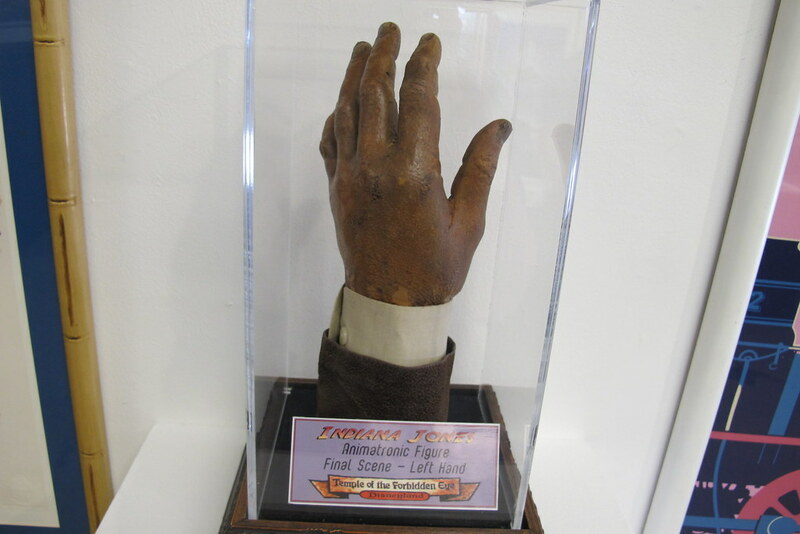 Among the more oddball items was this prop hand from the Indiana Jones animatronic figure in the final scene of the Indiana Jones Adventure attraction. Its value was estimated at $5,000-$7,000 but it went for $10,000. 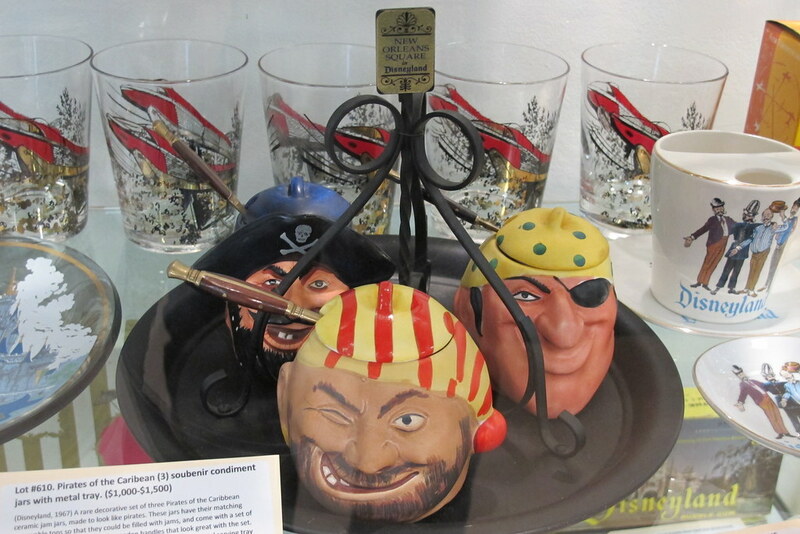 I adore most things mid-century so I guess it shouldn’t have been surprising that I was drawn to the items from the 1960s, like this set of condiment jars themed to Pirates of the Caribbean ($2,250). 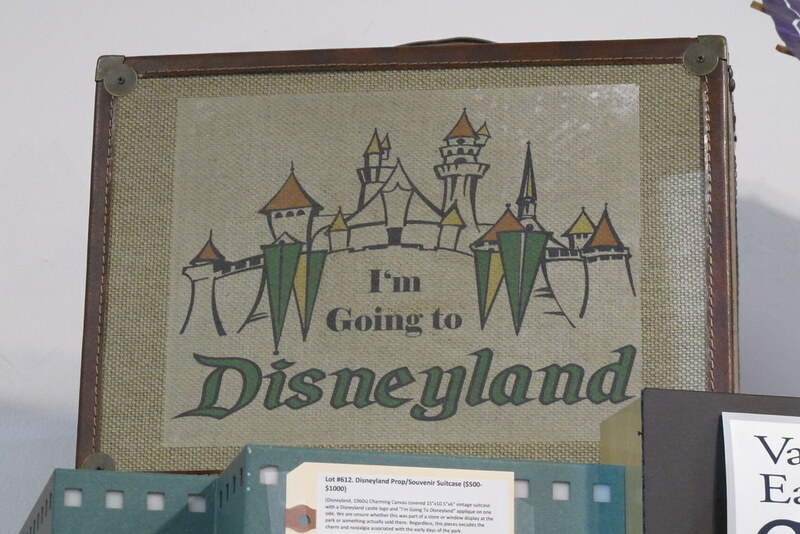 This 1960s canvas suitcase emblazoned with “I’m Going to Disneyland” ($2,250) was another of my favorite finds. The origin is a bit of a mystery — it’s unclear whether it was ever for sale at the park or of it was part of a store window display or other promotion. 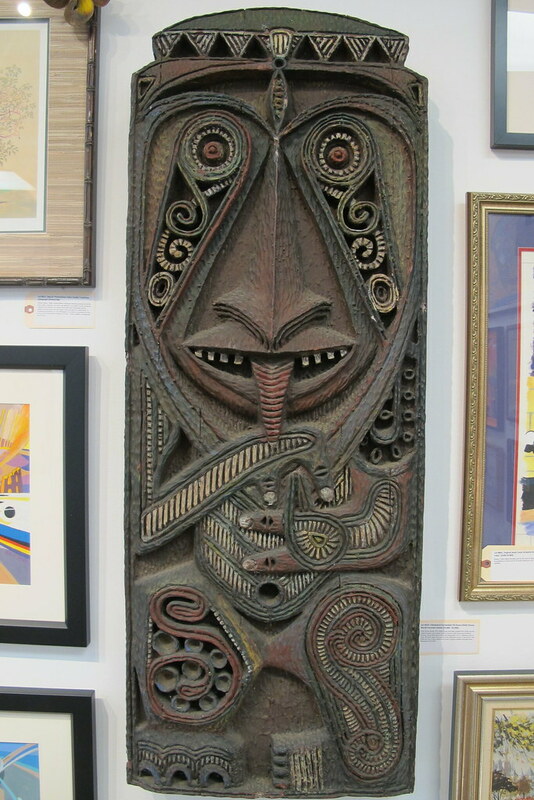 Also towards the top of my wish list would have been this Enchanted Tiki Room shield ($6,500) molded after the ones Rolly Crump designed to surround the “magic fountain.” Apparently, it had been part of a juice stand at The Poly in the 1970s. 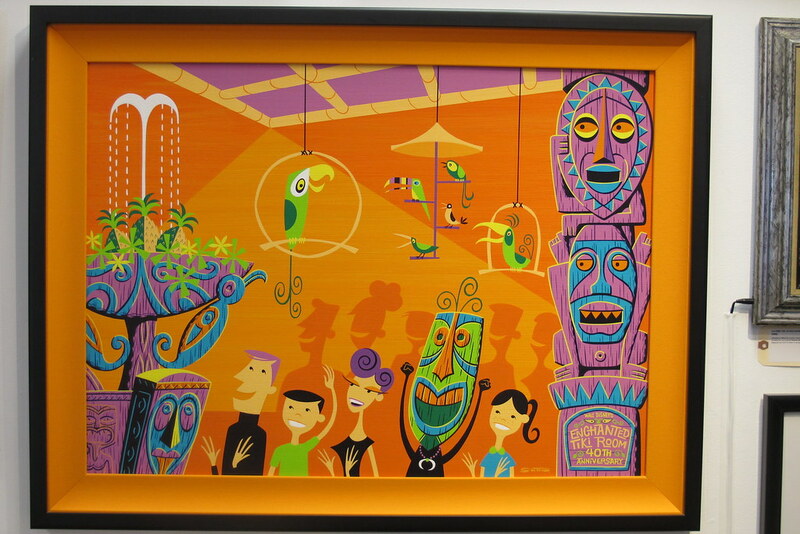 More recent items up for auction included “One Enchanted Evening,” an original Shag painting ($15,000) created for the 40th anniversary of Walt Disney’s Enchanted Tiki Room in 2003. What really made this exhibition special were the retired ride vehicles from the PeopleMover, Skyway and Space Mountain housed in a separate room next door. Visitors even had the opportunity to get in and take some photo ops. 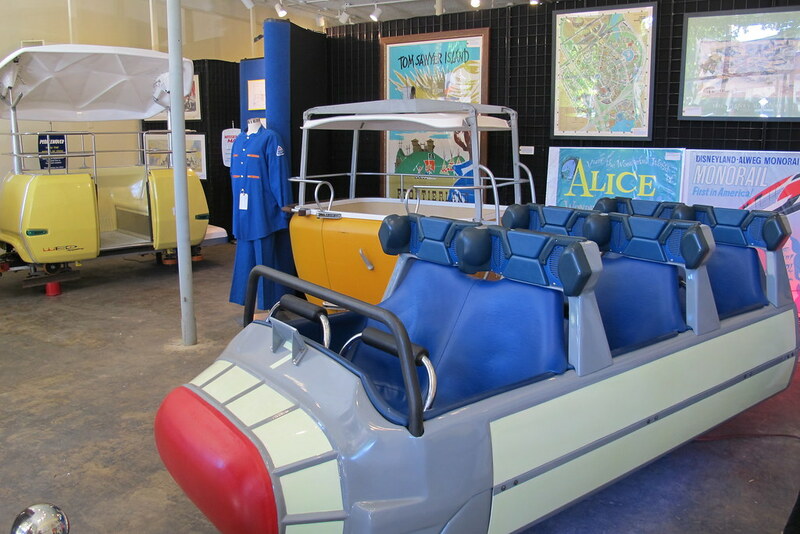 The PeopleMover vehicles (restored with the help of original designer Bob Gurr) were valued at $200,000-$300,000 but I didn’t see a final sale price, same for the Space Mountain car ($50,000-$60,000). In comparison, the Skyway bucket must have seemed like a bargain to the person who snagged it for $11,500. Alas, the auction has already come and gone, but you can still purchase the catalog for “Collecting Disneyland: An Exhibition and Auction” on Van Eaton Galleries’ web site for $30 for the softcover book and $95 for the hardcover (also includes the softcover). Pupu platters of crab Rangoon and spare ribs are staples on menus at tiki bars, but some places offer more unexpected fare like pizza, burgers and more. The gut-busting Biscayne Biscuits are my go-to brunch order at Psycho Suzi’s in Minneapolis. I describe them as the unholy (but amazing) offspring of eggs Benedict and biscuits and gravy. 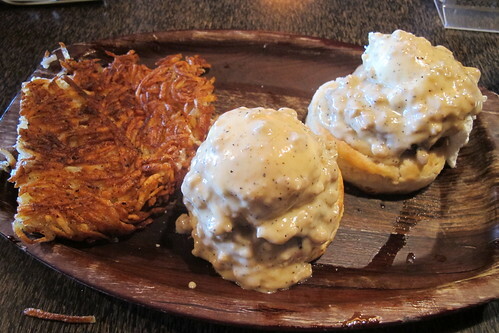 Two biscuits were topped with a sausage patty and poached egg, then covered with creamy housemade sausage gravy. 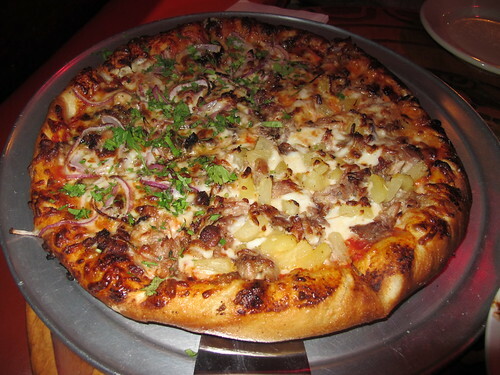 Pizza in paradise is what’s in store at Tahiti Nui on Kauai. The toppings are flavorful, and the buttery crust puts it over the top. 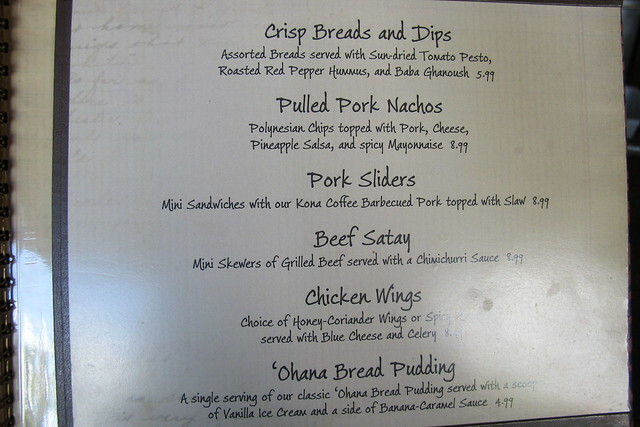 We loved the #3 Huli Huli Chicken with red onions and cilantro as well as #5 Da Hui with pineapple and kalua pork. 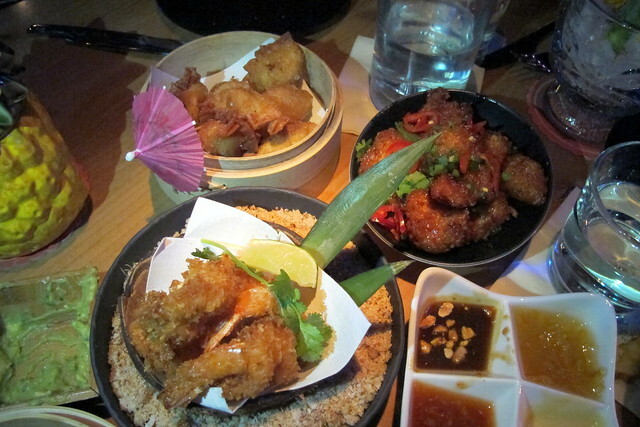 Although the attitude at London’s posh tiki lounge Mahiki wasn’t to my taste, the truffle and wild mushroom arancini certainly were. Sadly, these delicious risotto balls don’t appear to be on the menu anymore. Three Dots and a Dash in Chciago offers several small plates, including crab Rangoon and egg rolls. However, I think the best thing on the menu is the Thai fried chicken in garlic-chili sauce (upper right). 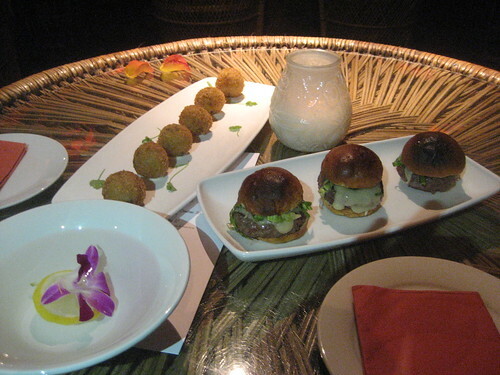 What are your favorite foods from tiki bars? 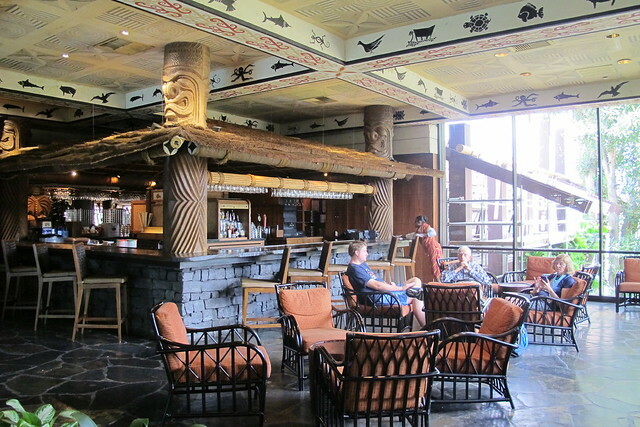 It’s located on the upper level of the Great Ceremonial House next to ‘Ohana restaurant, and in the evenings it gets packed with people enjoying drinks while waiting for their dinner reservations. The thatched hut bar is anchored by large carved tikis and overhead you’ll notice a tapa print ceiling. 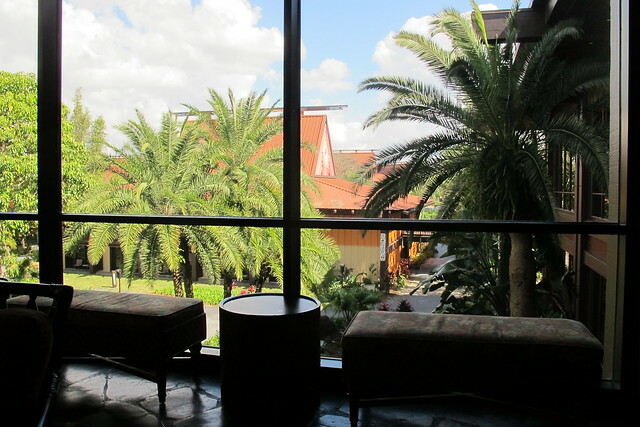 About a dozen chairs are available plus a few clusters of rattan armchairs and benches alongside the floor-to-ceiling windows overlooking the tropical landscaping and longhouses. 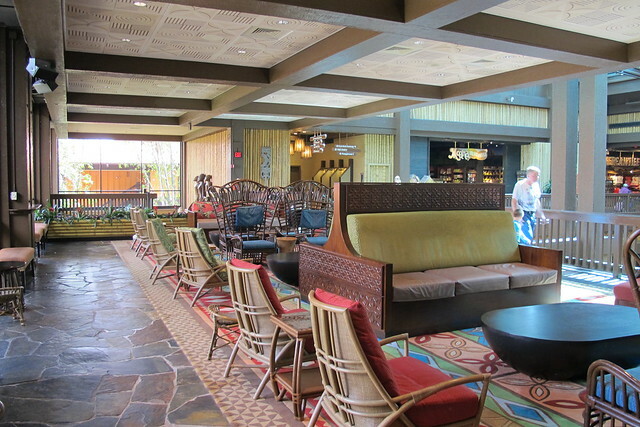 Extending out along the atrium is additional seating at brand-new furniture (part of the resort’s recent renovations). It’s a bit farther from the action, but it’s a nice spot to admire the new display of giant glass fishing floats in the center of the lobby. 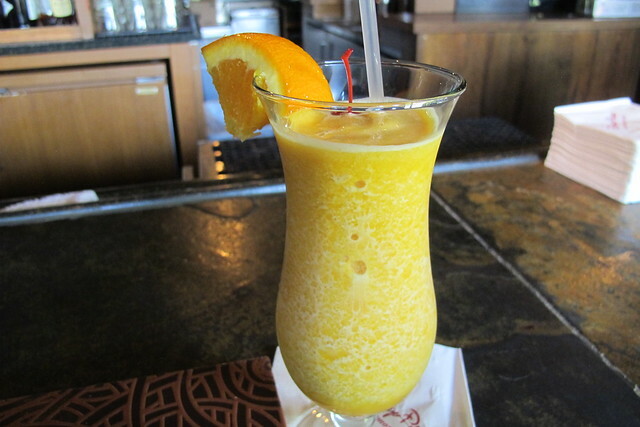 The most famous drink at Tambu Lounge is the Lapu Lapu, which is presented in a pineapple. 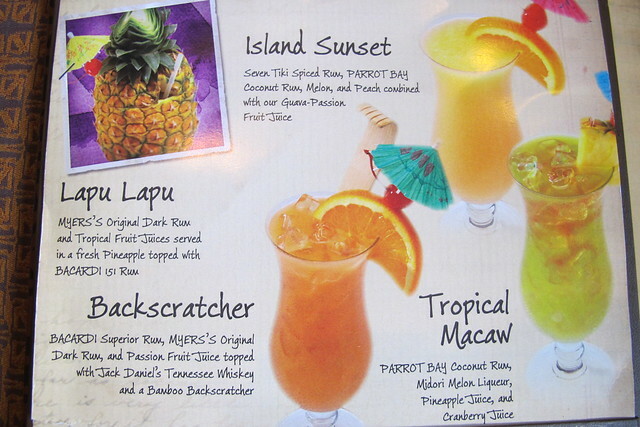 It’s one of four specialty drinks that are exclusive to this bar, along with the Backscratcher, Island Sunset and Tropical Macaw. There’s more to the cocktail menu, but it’s just the same standard drinks you’ll find at any other bar at Disneyland or Disney World. Don’t expect it to taste like a Chief Lapu Lapu drink, though, because there’s no passionfruit in it. Rather, it’s a potent concoction of Myers’s, pineapple juice, orange juice and Bacardi 151. 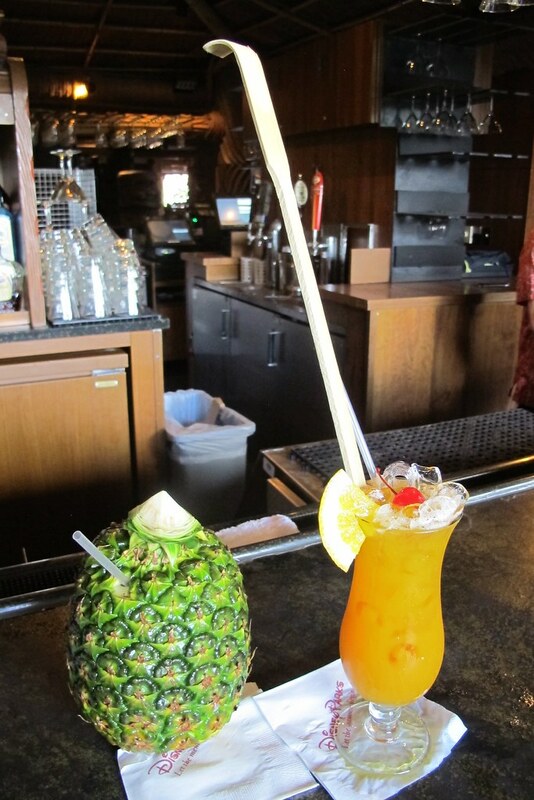 I was happy to cross the Lapu Lapu off my Disney World to-do list, but I actually preferred the Backscratcher, a riff on Hawaiian bartender Harry Yee’s Tropical Itch made with Bacardi, Myers’s and passionfruit juice, topped with Jack Daniel’s. Plus, it’s garnished with a bamboo backscratcher (much to the delight of my boyfriend 😉 ). I also sampled the Island Sunset (Seven Tiki spiced rum, Parrot Bay coconut rum, melon and peach with guava-passionfruit juice), but it wasn’t any great shakes. According to The Atomic Grog, some of the longtime bartenders will still make drinks from past menus, like the Scorpion, Navy Grog and Zombie. The booze starts flowing at 1 p.m., but food is only served from 5 p.m.-10 p.m. The short menu includes breads and dips, chicken wings, pork sliders, beef skewers and the amazing pulled pork nachos (also served for lunch and dinner at Capt. Cook’s restaurant on the main level). People also rave about the ‘Ohana bread pudding with vanilla ice cream and banana-caramel sauce. It’s the signature dessert from its neighbor restaurant, but you can try it here in the lounge without having to spring for that all-you-can-eat meal. 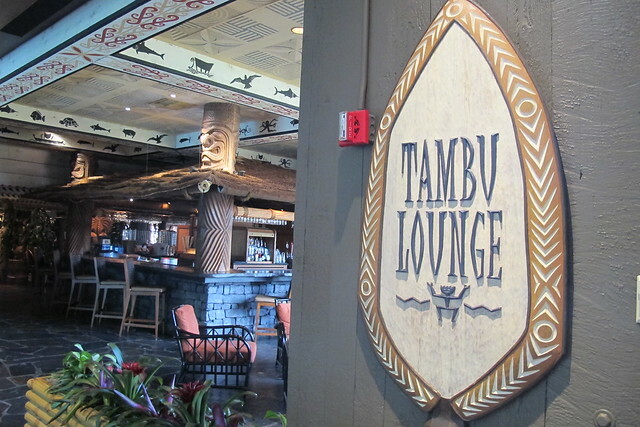 It’s pretty safe to say that the cocktails at Trader Sam’s Grog Grotto are going to blow these out of the water, but I’m sure Tambu Lounge will still draw the devotees it’s earned over the decades. I know I’ll be back for that bread pudding at the very least. In the meantime, I’ll be able to recreate the recipe for the Backscratcher at home, thanks to the reverse engineering of The Atomic Grog. Lunch at Capt. 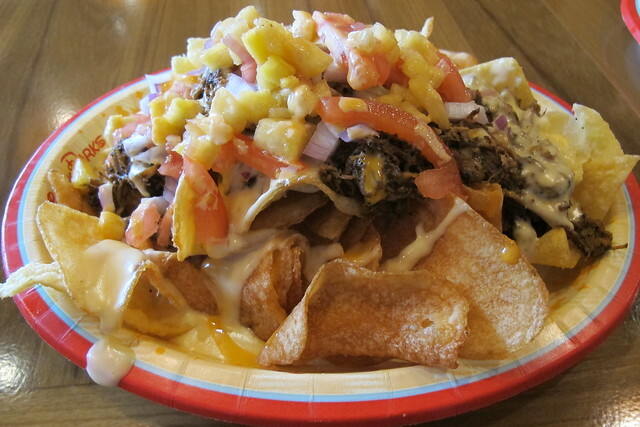 Cook’s: Set a Course for…Nachos!